Here is the official poster for the Illustrating Fashion event held by Cereal Box. Clear your schedule for Saturday, July 16th and come enjoy a night of fashion, music and entertainment. Come be inspired and surrounded by creativity!!!! "A night comprised of individual and unique perspectives on the concept of Fashion. The event will begin with a Fashion Parade of handmade garments by young aspiring designers with live music by Steph Rigano. Two young designers will launch their labels, ‘heart & bones' by Kyana Pike and 't-maree' by Tania Clarke. 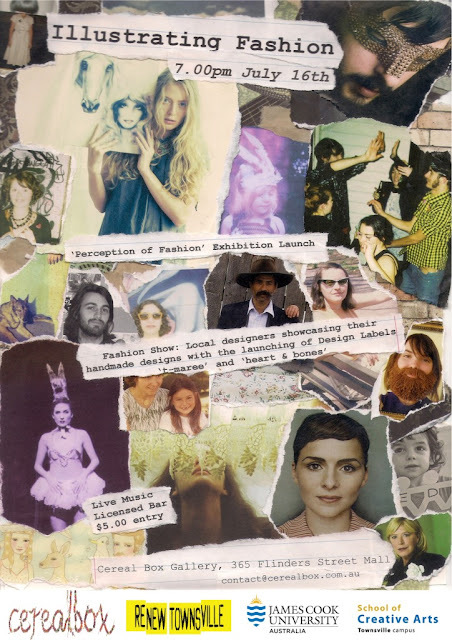 The night will be the launch of exhibition ‘Perception of Fashion’, a show illustrating the various outlooks and ‘perceptions’ of Fashion by talented local emerging artists. There will be performances afterwards by several local bands."